Located about 7500 light-years from Earth, in the constellation of Carina, lies a star-forming region known as the Carina Nebula. This dynamic, evolving cloud of interstellar gas and dust measures about 300 light-years in diameter and is one of the Milky Way’s largest star-forming regions. It is also an exercise in contrasts, consisting of bright regions of gas illuminated by intense stellar radiation and dark pillars of dust that obscure star formation. Infrared image of globular cluster 47 Tucanae (NGC 104) captured by ESO’s VISTA telescope. “My god, it’s full of stars!” said Dave Bowman in the movie 2010 as he entered the monolith, and one could imagine that the breathtaking view before him looked something like this. Except this isn’t science fiction, it’s reality — this is an image of globular cluster 47 Tucanae taken by the European Southern Observatory’s VISTA telescope at the Paranal Observatory in Chile. It reveals in stunning detail a brilliant collection of literally millions of stars, orbiting our Milky Way galaxy at a distance of 15,000 light-years. The full image can be seen below. 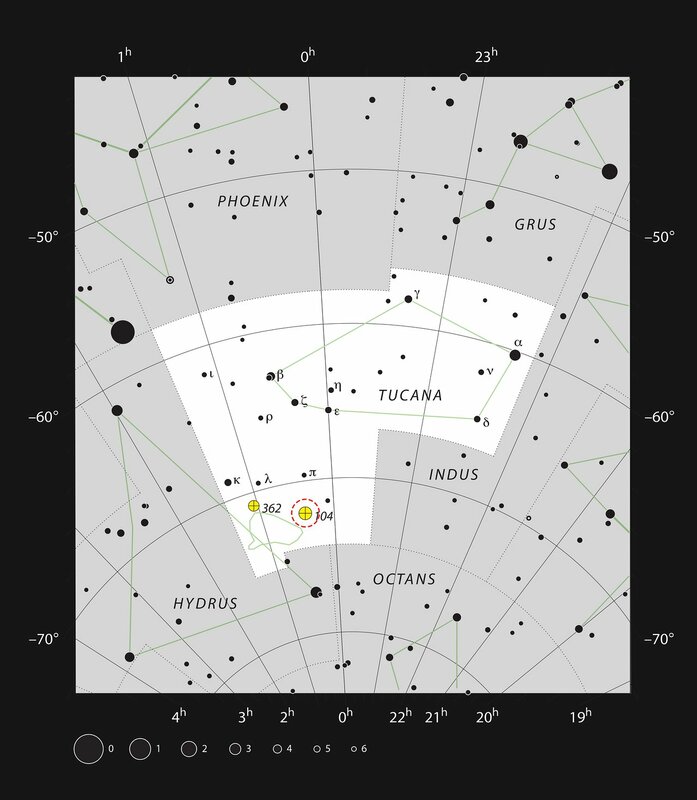 47 Tucanae (also known as NGC 104) is located in the southern constellation Tucana. It’s bright enough to be seen without a telescope and, even though it’s very far away for a naked-eye object, covers an area about the size of the full Moon. In reality the cluster is 124 light-years across. Although globular clusters like 47 Tucanae are chock-full of stars — many of them very old, even as stars go — they are noticeably lacking in clouds of gas and dust. It’s thought that all the gaseous material has long since condensed to form stars, or else has been blown away by radiation and outbursts from the cluster’s exotic inhabitants. Red giants can be seen surrounding the central part of the cluster, old bloated stars that are running out of fuel, their outer layers expanding. The background stars in the image are part of the Small Magellanic Cloud, which was in the distance behind 47 Tucanae when this image was taken. VISTA is the world’s largest telescope dedicated to mapping the sky in near-infrared wavelengths. Located at ESO’s Paranal Observatory in Chile, VISTA is revealing new views of the southern sky. Read more about the VISTA survey here. At an altitude of 2,635 meters (8,645 feet) the Paranal looks down onto a sea of clouds covering the Pacific Ocean, visible at right, whose shores lie 12 km in the distance. Where there once was 158, there is now more… Globular clusters, that is. Thanks to ESO’s VISTA survey telescope at the Paranal Observatory in Chile, the Via Lactea (VVV) survey has cut through the gas and dust of the Milky Way to reveal the first star cluster that is far beyond our center. But keep your eyes on the prize, because as dazzling as the cluster called UKS 1 is on the right is, the one named VVV CL001 on the left isn’t as easy to spot. Need more? Then keep on looking, because VVV CL001 isn’t alone. The next victory for VISTA is VVV CL002, which is shown in the image below. What makes it special? It’s quite possible that VVV CL002 is the closest of its type to the center of our galaxy. While you might think discoveries of this type are commonplace, they are actually out of the ordinary. The last was documented in 2010 and it’s only through systematically studying the central parts of the Milky Way in infrared light that new ones turn up. To add even more excitement to the discovery, there is a possibility that VVV CL001 is gravitationally bound to UKS 1, making it a binary pair! However, without further study, this remains unverified. Thanks to the hard work of the VVV team led by Dante Minniti (Pontificia Universidad Catolica de Chile) and Philip Lucas (Centre for Astrophysics Research, University of Hertfordshire, UK) we’re able to feast our eyes on even more. About 15,000 light years away on the other side of the Milky Way, they’ve turned up VVV CL003 – an open cluster. Due the intristic faintness of these new objects, it’s a wonder we can see them at all… In any light!